One of the value added service that ke Solutions provides is reffering to Domain Names, with all the matters involved: searching and choosing the best one for your business, management of the domain, neccessary consulting process, cost efficiency research, reselling options and so on. If you still have unsolved questions, please do not hesitate to contact us. We will not judge, analize or criticize you. The market is in a continual changing process. ke Solutions’professionals are here to help you keep up. You don’t need to know everything all the time. You just need to access the information that we provide for you. Our interest is your success. Choose private domain register for safety matters. Domain Search! Domain Transfer! Domain Renewals! © Copyright 2007 - 2019 - All rights reserved - Powered by ke™ and ke Solutions. 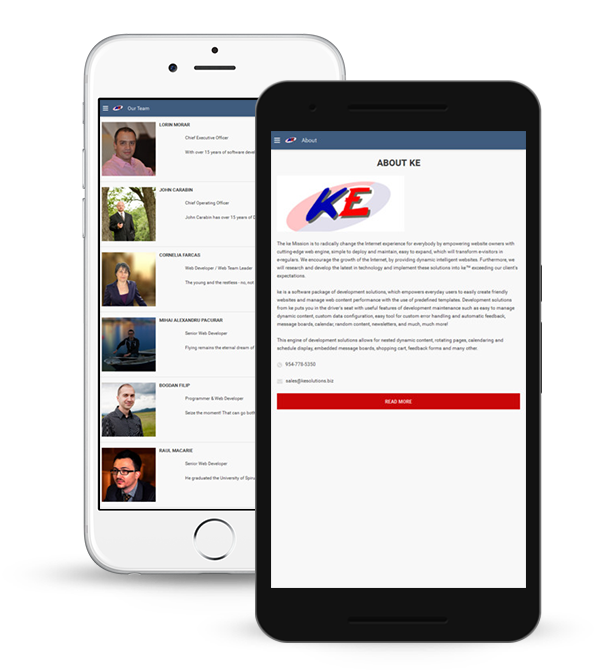 ke Solutions app - an example of how our features build a vigourous business app.